View the galleries for examples of client solutions. Any size of enclosure will be capable of handling High Potency , Biotechnology, and Allergen Drug product and Nanotechnology manufacturing. Our approach to a process is to solve potential issues with worker exposure, fugitive releases (Quality concerns about cross-contamination), and minimizing environmental impact while providing maintenance access. Tight work-spaces have become our specialty. Once a finishing process is released from development, it is usually necessary to rapidly implement it in full scale production. Regardless of the age of a facility, achieving contained operations is a challenge due to the nature of the materials handling at every step of manufacture. Instead of purchasing entirely contained equipment which makes access for dosing changes difficult, flexible enclosures form a first line economical solution without the major cleaning costs. Such solutions are light on the pocket - often purchased using a credit card authorization! A grit finish makes it difficult to clean the exterior of any equipment. Containment at the flange allows the equipment to be opened for inspection and sampling without emissions. Total enclosure of the jet mill allows it to perform without obstruction. The exhaust is vented through HEPA filters installed in the walls of the flexible containment. Every stage of processing can be contained using either a flexible-wall suite, or in this case flexible containment around the product collection and packaging step. The control panel and head of the tabletting machine are fully enclosed without compromising operator access. Excluding new scratch-built high containment facilities, it comes down to retrofit of existing facilities - many dating back to the 1970's without the advantage of newer leak-tight equipment. Handled properly, this exercise can be $millions less costly, with a time delay of mere weeks, and a virtual elimination of equipment re-validation. Furthermore, entire enclosure system(s) can be disposed of and replaced readily many times over with cumulative costs never approaching a fraction of the cost of a new facility. This also eliminates room cleaning costs, decreasing turnaround time. A 1 sq.m. Rosenmund filter installed through a floor. The sample port is approximately 1 foot below ceiling level. A glovebag is mounted onto the sample port. The glovebag allows the port to be rodded out before a sample drogue is admitted. Sufficient space is provided to allow the drogue to access the center of the filter cloth. The sample shown is a small enclosure used for safely adding materials, e.g. seed material or reagents, to a process during operation. The bottom of the glovebag has a tri-clover fitting for attachment to the vessel nozzle. The entire enclosure can be purged before the vessel valve is opened. Product travels from the overhead hopper to the liner below the glovebag. A small container of product from the first drop is used to top up the liner to specification. Weight parity (52 Kg +/- 13 g.) with a finishing site was achieved over several years of production. 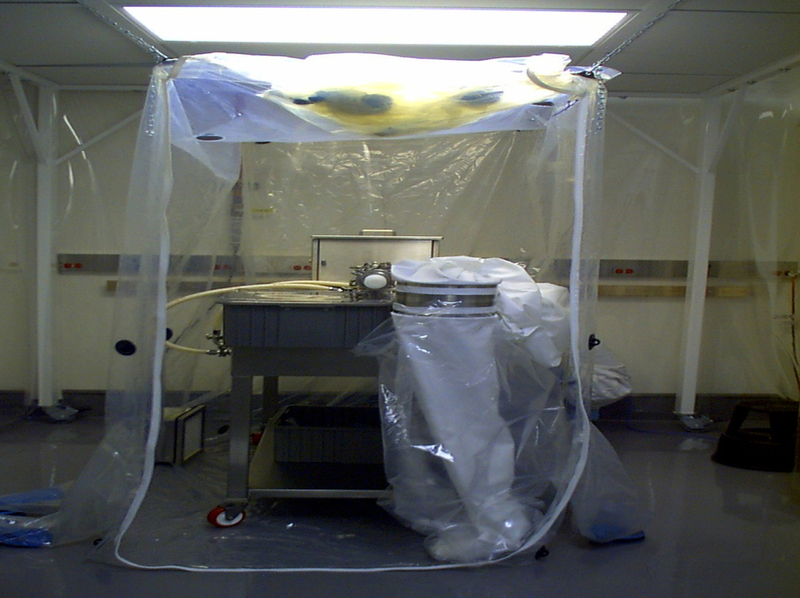 This small room enclosure was used to safely transfer rework material to a process. Such portable enclosures are highly adaptable for single or routine usage. A simple enclosure for filling out a processing ticket (or any smaller items, e.g stopwatch, in a contaminated workplace. The ticket is placed inside the glovebag before passing into the work area. After use it is recovered when the operator de-gowns. The frame is reusable. The enclosure is installed above the charge nozzle. Seed is added through a pass-through port designed into the glovebag. This system allows several different addition methods -in this case a T-nozzle approach to allow for a washdown.